Your school uniform is more than clothing that your students wear to school. It represents your school, its values, and reputation. So, you need to take the utmost care in designing the school uniform. Plus, you should get the best school uniform manufacturers in Hyderabad to professionally produce the uniform for your school. 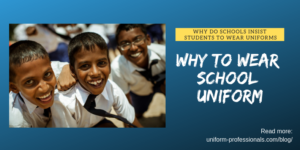 UNIPRO, one of the leading uniform suppliers in Bangalore, also offers readymade school uniforms in Hyderabad. We have been in this industry for over 25 years and have designed and manufactured school uniforms to over 150 schools in the city. Apart from school uniforms, we also design and produce school bags, shoes and other accessories that school children will need. At UNIPRO, we give you the convenience of ordering for uniforms online. You can call us, email us at rohit@uniform-professionals.com or fill in the message form on our website, leaving your contact details and we will get back to you. 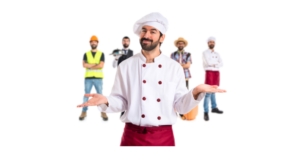 Once you come onboard, your school will have a dedicated account manager at UNIPRO who will handle all your requests, right from taking the measurements to ensuring the production team is working on your design to delivering the uniforms to your school. So, once you come to us, you can be assured of end-to-end services. It is this attention to detail and customized service that makes us one of the leading school uniform manufacturers in Hyderabad. Every year we come up with more selections of uniform styles and patterns. As our designers have ample experience in the industry, we will be able to suggest the right fabrics, patterns, and other details to meet your requirements and fit in your budget. We take the utmost care to ensure that we deliver the uniforms to your school in Hyderabad right on time as per the agreed times. UNIPRO can handle any volume of orders as we do large-scale production of uniforms. Our fabric experts suggest various kinds of fabrics such as wrinkle-free, anti-stain, moisture absorbent, fire resistant, anti-microbial, and more depending on your specific requirements. We use only the best fabrics that can withstand rough and tough use. 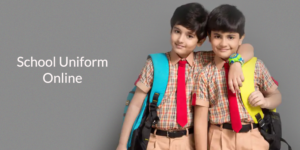 UNIPRO offers readymade school uniforms in Hyderabad in a variety of styles and pattern. School authorities can browse through the hundreds of designs to pick one that will be perfect for your school. Want to more about our uniform designs or place an order for school uniforms and bags? Contact us right away.